Keep pedaling longer without the synthetic sugars. 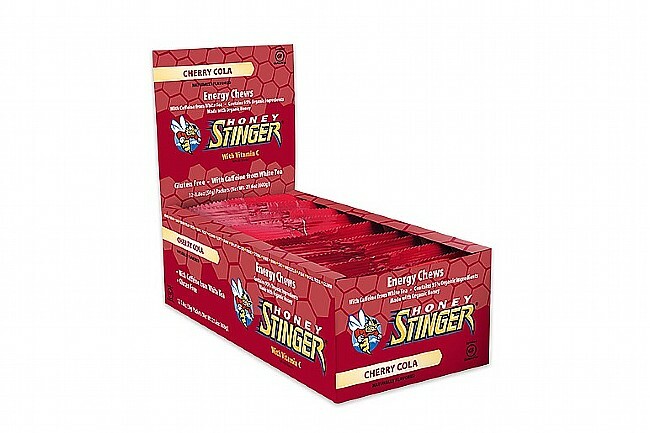 The Honey Stinger Organic Energy Chews are perfect for the health conscious athlete with a unique formula sweetened with 100% organic tapioca syrup and all natural honey. The convenient sizing and packing design ensures these healthy chews are easy to consume while you ride. 100% USDA certified organic, non-GMO, gluten free and dairy free with no partially hydrogenated oils or trans fats. 100% RDA Vitamin C along with 1g protein and 1g fiber per package. Honey Stinger Organic Energy Chews are sold in boxes of 12 packets. Flavors: Fruit Smoothie, Cherry Blossom, Pomegranate Passion Fruit, Orange, Limeade (with Caffeine), Cherry Cola (with Caffeine), Pink Lemonade, and Grapefruit. These chews are softer than Shot Bloks which is great in nearbelow freezing temperatures. The flavors are sick (lemonade, grapefruit, pomegranate passion fruit) but wont make you sick. Cons no caffeine. So I just wash em down with an espresso. Love the taste of the Honey Stinger Organic Chews, especially the fruit smoothie. There easy to digest and have got me through several borderline bonks. I use the chews on my runs 18 miles or shorter. I like that they are not sticky and taste great. The only negative is they are short on calories, and you have to eat too many to try and keep up. That is why I don't sure them for more than 18 miles. These really do taste amazing, I have to stop myself from eating them as snacks when I'm not on the bike. The sugar content is somewhat high but you're supposed to be taking them for fast energy anyway so no complaints here. The first time I went out with these chews, I hurriedly chomped some down in anticipation of a big climb up ahead. I did NOT chew them carefully and actually aspirated a tiny fragment into my upper trachea! It was a combination of full mouth and heavy breathing. One giant coughing fit later, I expelled the chew-bit onto the back of my front teeth. Still tasted lemon-limey good. Laughing inside, I made a note to self don't cram mouth full, chew completely, wash down with water, and don't eat them during raggedy breathing. I like em and now I respect em. These chews taste so good and are easy to chew and swallow. Love them! I bring these along for my 60 mile rides. When breathing hard it can sometimes be hard to chew and swallow some energy chews. But these are so soft and because they taste so good they go down easy. I use them as I do a gel but they are way better for taste. Good tasting little burst of energy. One or two every 15 or 20 minutes helps keep your energy stable. Part of my on bike calorie storage (probars 400 kcal, waffles 120?) seems to make a difference when there is a short way to real food or addition to current fuel when going up hill. Sometimes I just want some candy. Tasty and not too sugary! The Honey Stinger stuff is the best! It's not too sugary or overly sweet, which is almost bizarre for a gelgu type product. Other brands have so much sugar in them that it feels like you have little sweaters on your teeth after you've eaten them. This is far less the case with the Honey Stinger Energy Chews yet you get just as much instant energy as brand X.